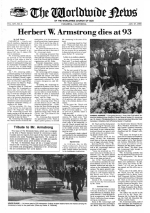 PASADENA - Family and Church members, dignitaries and representatives of national governments paid their last respects to Herbert W. Armstrong, 93, at Mountain View Cemetery in Altadena, Calif., Jan. 19. About 4,700 were in attendance. Mr. Armstrong, apostle and pastor general of the Worldwide Church of God, editor in chief of the Church's publications and founder of Ambassador College and the Ambassador Foundation, died at 5:59 a.m., Jan. 16, while resting in the bedroom chair of his late wife, Lorna.